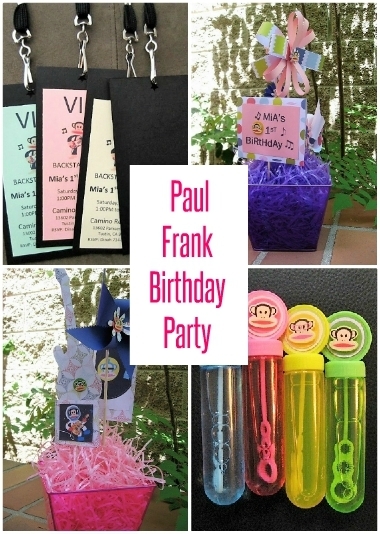 We had a Rock N Roll Paul Frank birthday party for my daughter because my husband loves music and I love Paul Frank, and well my daughter’s only turning one so she didn’t have much say. I knew it’d be a tough theme, so I had to get crafty and creative. 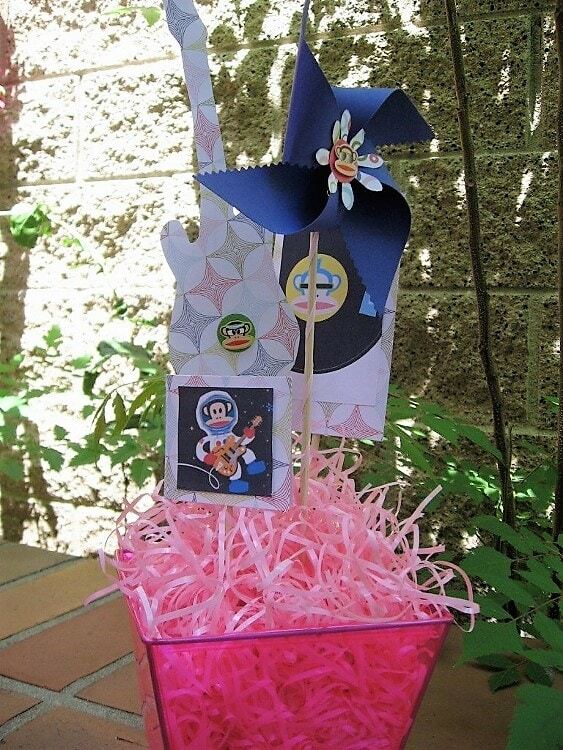 These do it yourself Rocker themed party invitations, using scrapbook paper, are SUPER easy to make. 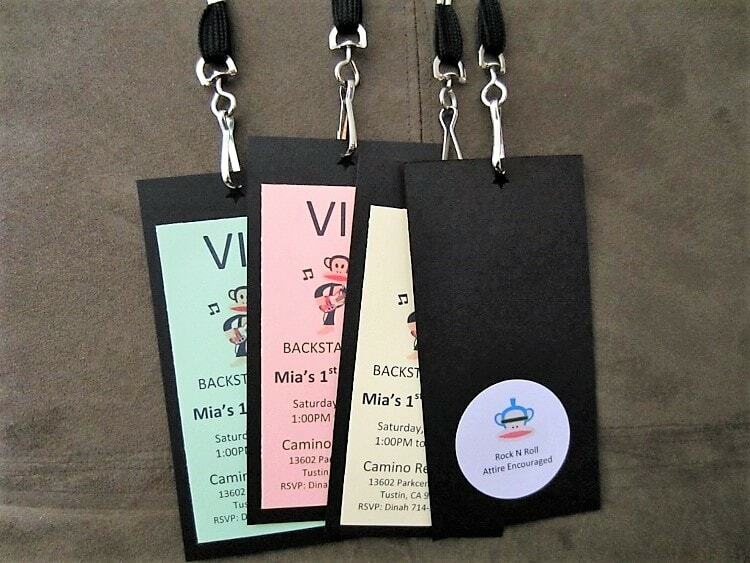 I wanted them to look like VIP concert backstage passes, so I purchased lanyards to attach to each one. You can purchase lanyards online for about $4.00 for a dozen. The party details fit on the front and I made a medallion for the back encouraging “rocker attire”. Each guest can wear them to the party as well if they choose. Tip: Stuff temporary tattoos in the invitation envelope to get guests started on their Rock Star outfits. I made these party centerpieces in purple, green, pink, and yellow. 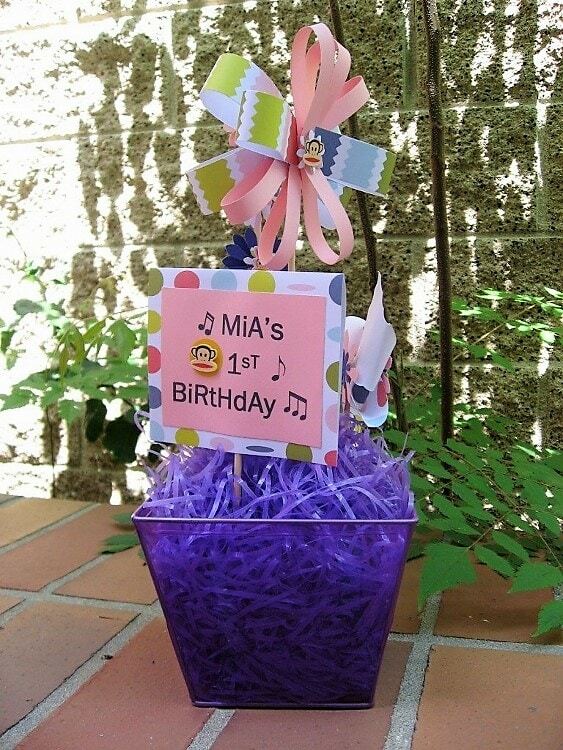 I went with colored plastic grass and paper flowers in “pots” because it is a summer birthday party. These are very simple to make, as the pictures speak for themselves. Just cut out the desired shapes and glue or tape them to wooden skewers. Insert them in decorative containers to make a decorative bouquet. You can make these arrangements in any theme you choose. Here are some tips. Colored candies, like M&M’s can also be used to conceal the floral foam. The dollar bins at major retailers like Target, always have cute containers in a variety of colors and patterns. Use rocks or pebbles at the bottom of your arrangement to weigh it down if your party is outdoors. One of my favorite things EVER is the good ole dollar bin, especially for parties. Many major retailers like Target, Joann Fabric and Craft Stores, and Michaels all have dollar bins with fantastic deals that you can easily personalize. You can find everything from party favors to decorations. 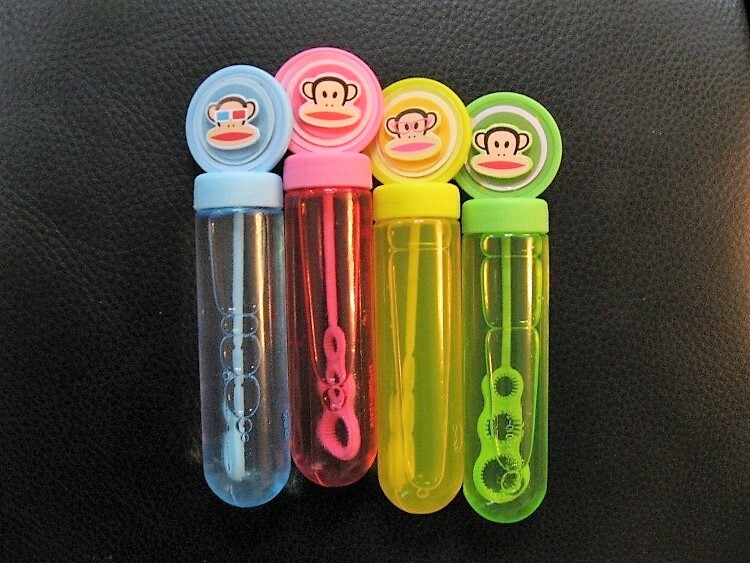 These bubbles were four for one dollar. The originally had an Easter sticker on the top, so I just placed a Paul Frank sticker over it to fit the party theme. These dollar bin boxes made perfect favor boxes. I added a personalized label and stuffed it with goodies for each kid like those popular rubber band bracelets. They come in a 12 pack for one dollar. I broker them up in sets of four and made my own personalized packaging. This favor cost less than thirty cents each!